Your first chance at a first impression is right in your reception area. Having the right desk and seating can make all the difference in the world. You will find some beautiful but affordable wood veneer desks and other furnishings. You can also find very comfortable seating for guests and visitors. The Amherst Wood Series from Lesro is available in both open back and panel arm models to best fit the needs of your guest and reception area. 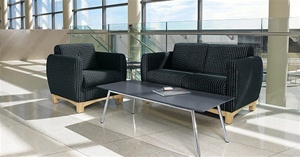 Available in many fabrics, this series offers uncomplicated design that can be configured to fit just about any space. These benches are presented in a relaxed contemporary style. A vast selection of chairs from Contemporary to Traditional with style and comfort at affordable prices! 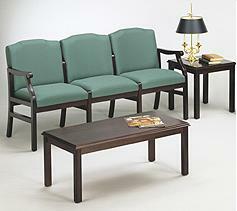 The Ashford Series Reception Furniture offers a traditional styling with a rolled arm design. Choose from a wide variety of fabrics, along with your choice of beautiful hardwood finish to create the perfect combination for your space. This series ships to you ready to assemble! Be one of the first to enjoy the Mayline Group's newest lounge seating solution...the Santa Cruz Series. 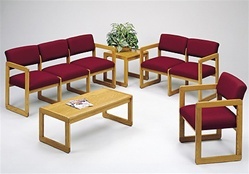 The Belmont Series Reception Seating features a refined exposed leg design. This series is made of heavy duty construction with a 400 lb. capacity standard on all seating, with option 750 lb. capacity chairs also available for purchase. 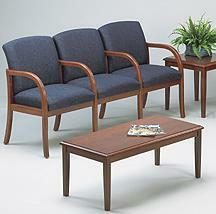 The Brewster Series Reception Seating features a sophisticated, open arm style, along with a refined exposed leg. The combination of these designs radiates sophistication and beauty at first glance. This series is available in numerous fabrics, along with a choice of wood finish. 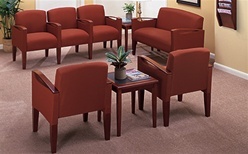 The Franklin Series Reception Furniture offers an updated design, fully-featured construction with matching accessories, and an affordable price. This series offers an open back, which allows for easy cleaning. Attractive. Comfortable. Stylish. Solid hardwoods, genuine leather, and modern lines. 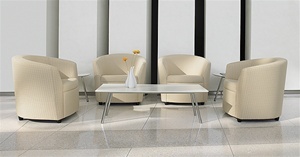 The Siena Series is a modular system that allows complete layout flexibility for any space. It provides a heavy duty construction with a weight capacity of up to 400 lbs. per seat. With unlimited fabric and finish options, you're sure to find a style that matches your space! The original sled base design can be found in the Classic Series from Lesro. Aside from a sled base design, this series is available in a round back, ergo back, full back or open back, as well as an extended arm. The Hartford Series features a classic style with a rosette detail that adds elegance. Available in many sizes this series can easily be configured to allow a layout design to fit your needs. Lesro offers hundreds of fabrics and finishes, along with beautiful wood finishes to create your ideal color combination. Made of durable solid oak construction, the Contour Series is available in a full back, ergo back, round back, as well as and open back. All styles are available in the same fabrics, so you can mix and match throughout your office as you see fit. 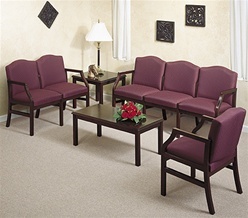 The Newport Series features a wallsaver design and offers standard, oversize and bariatric guest chairs. Mix and match different chair sizes for your reception area, all of which are available in a silver, black or white metal finish. The Somerset Series Reception Seating features a sophisticated look with an open tear drop arm design. 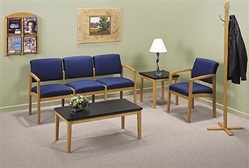 This series is a great solution for any reception area, as each seat comes standard with a 400 lb. 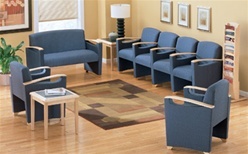 capacity which allows you to accommodate guests or patients of all shapes and sizes without ordering additional furniture. Somerset occasional tables match perfectly to the wood finishes on the chairs and come with a durable high pressure laminate inset giving your reception area a modern look and allowing you not to worry about the wood being ruined by food or drink. Make a great first impression with beautifully contoured traditional rolled arms from the Madison Series. This series features solid hardwood construction on both the seating and tables, all of which are available in a variety of finishes. Possibly one of the most popular lines that Lesro offers is the Lenox Series. This series features an open back, along with matrex seat support for life-long comfort. Just added, this series is now available with either an open or panel arm style! 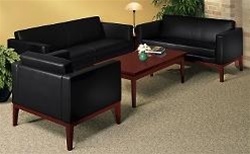 The Savoy Series Reception Seating is perfect for any office or waiting room area that's looking for heavy duty reception furniture. The Savoy Series features a 400 lb. capacity on all standard seating. This collection is available in numerous fabrics and vinyls and is fully upholstered. A modern club chair, fully upholstered with a fixed non-removable seat cushion.